The application receives data through XHR communication (from local directory) and displays a layout as displayed in the figure below. The remote control can be used to select the articles and change the layout. Resource/image Contains the image files for the application. Resource/icon Contains the image files for icons. The classes and their description are as follows. Main Serves as the first access point of the news application. NewsController Provides overall control including handling events from keys on the remote control managing UI that is displayed on the TV screen, and making the model and view synchronized. KeyHandler Passes button inputs from the remote control to NewsController. UIList Fits data into the list area to create a proper layout. UIContents Fits data into the contents area to create a proper layout. DataMgr Manages the application data. CategoryMgr Manages data stored in individual categories. XHRToolKit Requests and receives data for a given URL through XHR communication. This task describes the steps to create a news application, access it, and use the remote control. Start the Samsung Smart TV SDK. Click File > New project to create the project named ‘News’. A new project and config.xml file are created. Add the file to the SDK, and add the code given below. The common modules provided by the Application Manager are included as $MANAGER_WIDGET/Common/API/Plugin.js. For detailed information, see Using Common Modules. Create the Main folder and create Main.js file in it. Include the Main.js file. The HTML code includes the three common modules and the Main.js file. The onload and onunload properties of the <body> tag are assigned to Main.onLoad() and Main.onUnload() functions, respectively. On accessing the application, the index.html file is loaded and the Main.onLoad() function assigned to onload is executed. Add code in the Main.js file as shown below. Start the SDK emulator. If the alert() : Main.onLoad() message is displayed in the log manager, the application has been launched. Insert a div element in the index.html file and link it to CSS. If a ready message is sent to the Application Manager through the common module, the application is displayed on the screen. Add code to use the common modules in Main, and create an NewsController object. Create a UIList object to display the initial page. Add the following code to the <body> tag in the index.html file. Create the UIList.css file and add the following code. Add the following code to include UILIst.css file in <head> tag of index.html. CSS can be applied only after the appropriate files have been included in index.html file. To display the image, create a UIList object that is in charge of the List page and display it on the screen using the NewsController object. Create the UIList.js file. Add the code given below. Include UIList.js in index.html. The NewsController object calls the create() method of the UIList object to initialize UIList, and calls the show() method to display the UIList div on the screen. Modify the Main object code to call the NewsController object. Main initializes the NewsController object, creates the application, and calls the sendReadyEvent() method to pass an event to the Application Manager. It calls start() to start the UI. A semi-transparent image is displayed on the left side of the screen. This section explains making the application respond to events from the remote control. Pressing Enter on the List page, takes you to the Contents page. Pressing Return on the Contents page, takes you to the List page. When any button on the remote control is pressed, a keydown event occurs. If focus is given to <a> tag and a remote control button is pressed, <a> tag receives and handles the event. Add <a> tag to index.html and register key handler methods with the onkeydown property. If a keydown event occurs, each anchor executes the KeyHandler method registered with the onkeydown property. Create a KeyHandler object. The KeyHandler object sets anchors for each create() method and uses a switch statement to process the key events that occur. The unique value of each key is obtained from the TVKeyValue common module. Methods to give focus to each anchor are created. The applicationAPI.blockNavigation(event.keyCode) method prevents automatically returning to the Application Manager when the Return button is pressed. For more information about applicationAPI.blockNavigation(event.keyCode), see blockNavigation in Widget Object. Add Contents div, create the CSS and include it in the index.html file. The process is similar to that of adding a List div. Create a UIContents object for displaying content on the Contents page. Before the UIContents object is used, call the create() method. To display the content on the screen, the object calls the show() method. To handle key events, it calls the focusToContents() method of KeyHandler. To hide content from the screen, it calls focusToKeyBlocker() that prevents receiving other key events. Add the following code to the UIList object to receive key events through the KeyHandler object. The application is ready to make page transfer with button inputs. KeyHandler notifies NewsController of remote button inputs to handle those inputs. To make the NewsController object handles page transfers, modify NewsController. 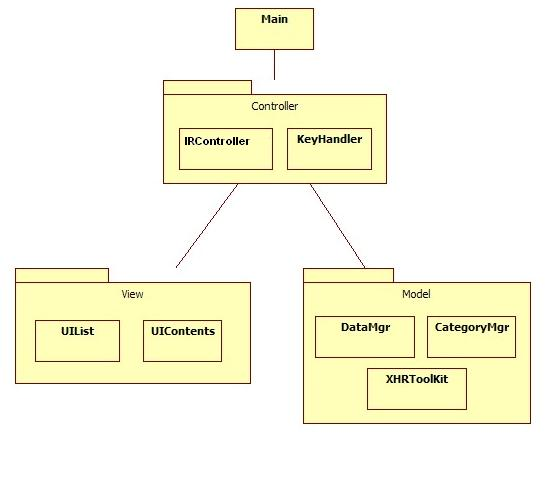 To identify the UI object being displayed on the screen, define currentState variables and the state of each variable. Using the request() method, objects request NewsController to process the request. Add the task to be performed by NewsController to the work list. Add case statements for the request() method. Add the code needed to process the requests. If a remote key event occurs when the List page is being displayed, that is, when listAnchor of KeyHandler has focus, the listKeyDown() method of KeyHandler is executed. If Enter is pressed, KeyHandler executes the request method NewsController.LIST_START_CONTENTS of NewsController to make the page visible. The NewsController object calls the hide() method of the UIList object to hide the List page, and calls the show() method of the UIContents object to make the Contents page visible. Start the application. Pressing Enter displays the Contents page. Pressing Return displays the List page. Modify the UIList div tag as shown below. Modify UIList.css as shown below. Modify the UIContents div and CSS as shown below. In this task, the tutorial examines how to receive, parse and store data to be displayed by the News application using XHR communication. Because of copyright issues, News data is provided in the form of XML files. The XML files are stored on a local drive and the News application accesses them through XHR communication. The process is the same as receiving data from the Internet using URLs, except that a local drive is used. News data is provided in the form of XML files. Through XHR communication, the News application requests and receives data in a URL. It then parses the received data to put them in a structure to display on the screen using UI objects. The application uses the following classes or objects to request, receive, parse and store News data. The DataMgr object manages all data transmission procedures. The DataMgr has multiple CategoryMgrs, and each CategoryMgr manages data in a category. The XHRToolKit class creates an XHR object, and requests and receives data from URLs. Create a XHRToolKit class to perform communication for News data. The XHRToolKit class requests and receives News data, and passes a Boolean value indicating the success to the registered callback. Objects using an instance of this class get the received data using the getResponseXML() method. When a class instance is created, the XHRToolKit class receives a URL to be used to request data, and a callback function to pass the communication result. It requests data from the URL using the sendXHRRequest() method, and passes a Boolean value indicating the communication success status to the callback function. The sample source code given below calls the destroy() method of the XHR object. This code solves the problem of memory shortage in TV environments. For detailed information, see Example for XHR communication. Create an XHRToolKit.js file and include it in the index.html file. Add the code below in KEY_RIGHT case of the KeyHandler.listKeyDown() method. This makes communication happen on pressing the right button on the remote control in the List page. Add the following code to the KeyHandler.listKeyDown() method. This displays the initial 300 words of the data received using a XHR object of test_XHRTool, using the alert() function. Create a CategoryMgr class for parsing the received data and storing it in a structure. Create a Structure.js file and add the code below. Include it in the index.html file. The CategoryMgr class has an XHRToolKit class instance as a member variable to receive News data. The received data is parsed in the onReceiveData() method and stored the arrArticles structure array. To create an instance, it receives as an argument an object with ID, title, URL and callback as properties. After parsing and storing the data, it notifies the appropriate category of the completion of data request and receipt by passing the ID to the callback function received as an argument. The goal of this section is to create a CategoryMgr instance and make communication happen when the left button on the remote control is pressed on the List page. Add the code below in the KEY_LEFT case of the KeyHandler.listKeyDown() method. Add the code shown below to display the category of the received News data, the number of news articles, and the title of the first article. If the log manager is displayed when the left button on the remote control is pressed on the List page, the implementation of the function is successful. Create a DataMgr object to manage all News data. This object synthesizes data in many categories and provides the data to other objects when needed. The create() method must be called before using this object. If there is a category for which a data request is to be made, call the sendRequest() method of this object. The sendRequest() method receives category ID and a callback function that is executed after data receipt and processing. Add the code below to the Structure.js file to store information on individual categories in structures. Add the code below to set information on an individual category. Include the Define.js file in the index.html file. Create a DataMgr.js file and include it in the index.html file. // Save data recieved from CategoryMgr and execute callback function. Add the code below in the KEY_UP case of the KeyHandler.listKeyDown() method. The function below displays the category of the received News data, the number of articles and the title of the first article. Add this function. If the log manager appears when the up button on the remote control on the List page, the function implementation is successful. This section looks at displaying news data received from the Internet on the List and Content pages, and making the application respond to other key events. The data managed by the DataMgr object is displayed on the screen using the UIList object. The data needed for the List page are the category name and 10 news articles. The Category name, article title and some of the articles are displayed in the preview area of the List page. Below the preview area, 10 article titles are displayed. Add the following method to the DataMgr object to request the data to be displayed. Modify the UIList object and display the selected data. Use the wrapInTable() method to set data in ten title divs. This is to display multiple languages in appropriate ways. The vertical-align property of this displays words with different font sizes in the vertical center. Add a Util object and create a method for it. Modify the NewsController object. The create() method of NewsController calls the create() method of DataMgr to initialize the DataMgr object before using it. Add code for setting the data to the showList() method. The NewsController object receives data from the DataMgr object, and displays the List page displayed using the UIList object. Start the application to see the data received from the Internet displayed on the screen. On the List page, 10 article titles are displayed. If a title is selected by the user, it gets surrounded by a green box, which means that the title is highlighted. The highlight moves to the previous or next article title when the up or down button is pressed on the remote control. Create a titleIdx variable in which the location of the highlighted title is stored to identify the selected article. Create the function to highlight a title. The methods below receive the location of a specific title as an argument and change the background image of Div of the title. If no arguments are received, the title indicated by the titleIdx variable of the UIList object is highlighted. Call the highlightTitle() method in the show() method of the UIList object. When the application starts, the title number ‘0’ designated as titleIdx is highlighted. Move the highlight by pressing remote control buttons. The KeyHandler object receives remote control key events, and notifies the NewsController object. The NewsController calls the appropriate functions. If the down button is pressed on the List page, the KeyHandler object requests NewsController to perform the LIST_ARTICLE_DOWN action. Add the code below in the KEY_DOWN case of the listKeyDown() method of KeyHandler. The NewsController object processes the KeyHandler object requests. Add LIST_ARTICLE_DOWN to the request list of NewsController, and add a case to the request() method. The UIList object removes the highlight from the currently highlighted news title and gives it to another title. Add a method to UIList, and call the method from the LIST_ARTICLE_DOWN case of the NewsController object. Pressing the down button on the remote control moves the highlight across other titles. The top of the List page displays some of the news articles being highlighted. When the highlight moves to other titles, the article currently displayed on the List page must be changed. The NewsController object is responsible for the response when the down key is pressed in the last title, and for deciding the number of articles before the article with the highlighted title. Assume there are 15 news articles in a category. The UIList object shows articles 1 to 10. If the down is key pressed when article 10 is highlighted, the articles 11 to 15 are displayed. If the down key is pressed when article 15 is highlighted, the titles of article 1 to 10 are displayed on the screen. In order to change the titles currently displayed, dataObj used by the UIList object has to be modified by NewsController. Add the code notifying NewsController to modify the dataObj when the down key is pressed. Add the code below in the LIST_ARTICLE_DOWN case for the NewsController object to identify the location of article currently displayed in the news data category. Add LIST_LAST_TITLE_DOWN to the NewsController list. Add a case to the Request() method. The UIList object must replace the currently used data when receiving a request and give a highlight to the first article title. Refresh all data on the screen. Add the following function to the UIList object. The tasks needed for the down key are now completed. When the highlight is moved across the titles, the news article displayed at the top of the page changes. If the down key is pressed when the last title is highlighted, the next news article is displayed. 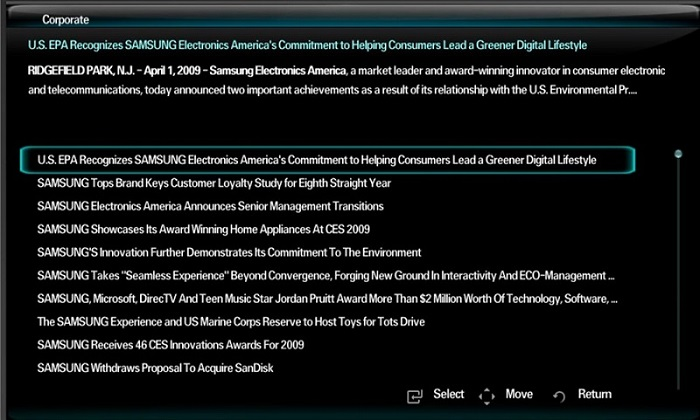 News article content is displayed using the UIList objects. Pressing the Enter key on the List page, displays the Contents page. 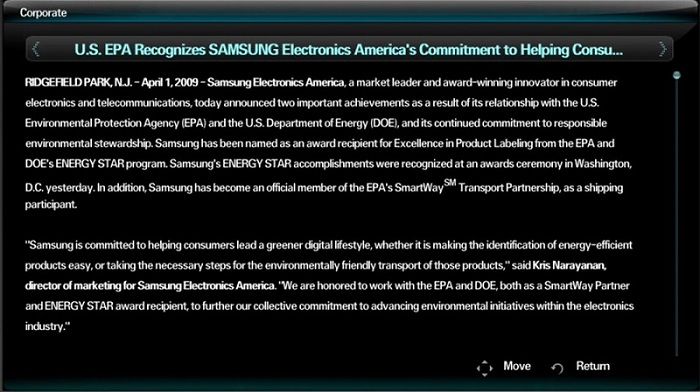 The content and title of the News article receiving the highlight when the key is pressed are displayed on the screen. Add a method to the DataMgr object requesting the data used by the UIList object. This method receives the category ID and index of the article, and has category name and the article as properties of its return values. Add the code below to the UIContents object to display data on the Contents page. Create a method to set a data object to be used by UIContents, and display the set data on the screen. Modify the showContents() method of NewsController. Add code that sets the data before the Contents page is displayed. Start the application. Pressing the Enter key on the List page displays the article with the highlight on the Contents page. Scroll up/down to view all the News content. For this, there must be an object having focus and receiving key events for scrolling up/down. Each article has an anchor tag. See the fillDescription() method created before. Modify the focusToContents() method to give focus to the added anchor. This makes the scrollbar move. For more information on scrolling up/down, see Adding a Scroll Bar. This task describes changing a category or news article currently displayed on the screen using remote control key events, and creating and using a scrollbar. The listKeyDown() method of the KeyHandler object, requests the NewsController to assign LIST_CATEGORY_LEFT and LIST_CATEGORY_RIGHT for KEY_LEFT and KEY_RIGHT events, respectively. It adds the foregoing task to its list and adds a case to the request() method. The NewsController checks whether data exists. If there is no data, it requests data using DataMgr. The changeCategory() method is called to refresh the List page. The changed categories respond to the left and right key events on the List page. The news articles on the Contents page can be changed by pressing the left or right key on the remote control by adding the code given below. When the left key is pressed, the previous article is displayed, and when the right key is pressed, the next article is displayed. Pressing the right key when in the last article, takes you to the first article in the same category. Pressing the left key when in the first article, takes you to the last article. When KEY_LEFT or KEY_RIGHT event occurs, the contentsKeyDown() method of the KeyHandler object requests the NewsController object to call the CONTENTS_ARTICLE_LEFT or CONTENTS_ARTICLE_RIGHT cases, respectively. NewsController adds the foregoing task to its list and adds the code below to the request() method. It calculates the index of all the articles and replaces the data currently displayed by the UIContents with new ones. Add the function below to UIContents. If the left or right key on the Contents page is pressed, the article currently displayed on the screen is replaced with another one. This section describes creating a scrollbar on the List and Contents pages. On the List page, a scrollbar is created by receiving the index of the currently highlighted article and the number of the total articles as arguments. If the number of the total articles is less than 10, the scrollbar does not appear on the screen. this.hideScrollBar();    // hide scroll bar. The scrollbar appearing on the Contents page is more complicated than that on the List page. The Contents page scrollbar must change its length based on the entire length of the article being viewed. Use the scrollTop , scrollHeight and offsetHeight values of the area where the article is displayed. 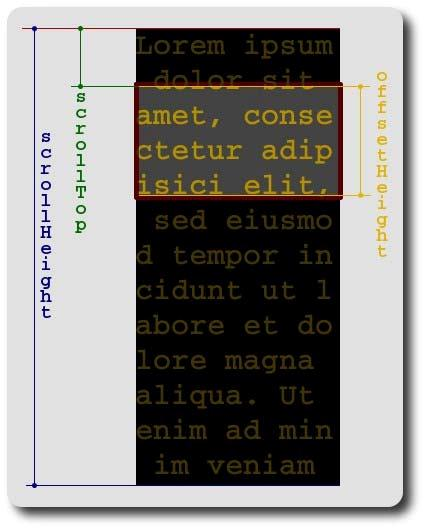 The offsetHeight indicates the length of the scrollbar actually displayed on the screen, the scrollHeight indicates the entire length of the article, and the scrollTop indicates the part of the article that is being viewed. The application calculates the length based on these values to display a scrollbar. The scrollTop value cannot be changed after scrolling starts. The function executed as a callback function of the timer finds out the scrollTop value that has been changed by a key input. Add the method below. This method works properly only when it is called using the timer. The contentsKeyDown() method of the KeyHandler object requests NewsController to make CONTENTS_SCROLL_UP and CONTENTS_SCROLL_DOWN respond to KEY_LEFT and KEY_RIGHT events, respectively. NewsController adds this request to its list and adds a case to the request() method to execute the code below. Press the up or down key, to make the scrollbar move across the screen.